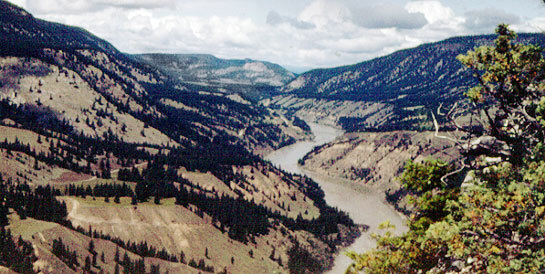 Fraser River south of Williams Lake. Robert Cannings. Dry Forests clothe the hills of the Cariboo-Chilcotin region. 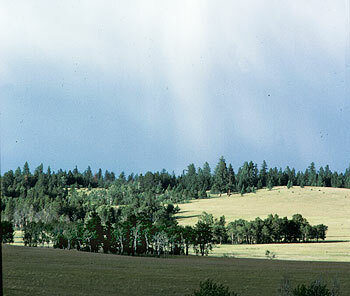 They are dominated by Douglas-firs, with extensive stands of Lodgepole Pine and Trembling Aspen. Lodgepole Pines at Kleena Kleene, Chilcotin. Richard Cannings. Grasslands are scattered here and there where it is too dry for trees to grow or where fires have pushed back the forest. 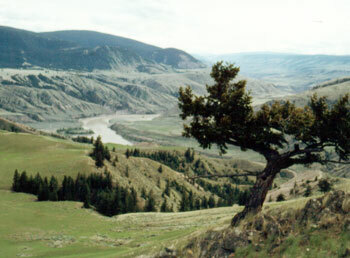 Grasslands associated with groves of Douglas-fir, Lodgepole Pine and Trembling Aspen, Riske Creek, Chilcotin. Sydney Cannings. 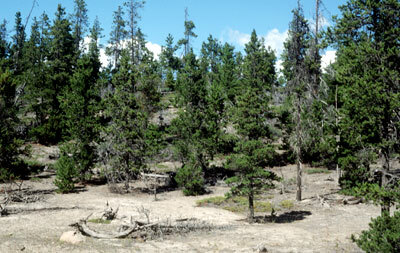 Along the Fraser and Chilcotin rivers, this Dry Forest borders the even drier grasslands of the Bunchgrass Zone. At the junction of the Fraser and Chilcotin rivers the Dry Forest meets the Bunchgrass Zone. Robert Cannings.